A Postcrossing postcard from Anne in Finland. 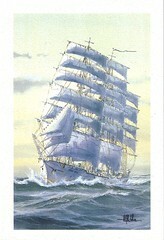 The three masted, full rigged “Suomen Joutsen” was built in 1902. She has a steel hull and plied the trade routes between ports in the Atlantic and Pacific Oceans. Since this was before the days of the Panama Canal, this means she frequently passed through the treacherous waters of Cape Horn on the southern tip of South America. In 1930, the Finnish Navy purchased this beautiful ship for use as a Training Vessel. From the mid 1950’s she was a stationery seamen’s training vessel, but in 1991 she was purchased by the city of Turku and operates as a museum. What a beautiful grand lady of the sea. And what a gorgeous painting by Håkan Sjöström. Thanks Anne. You made my day!